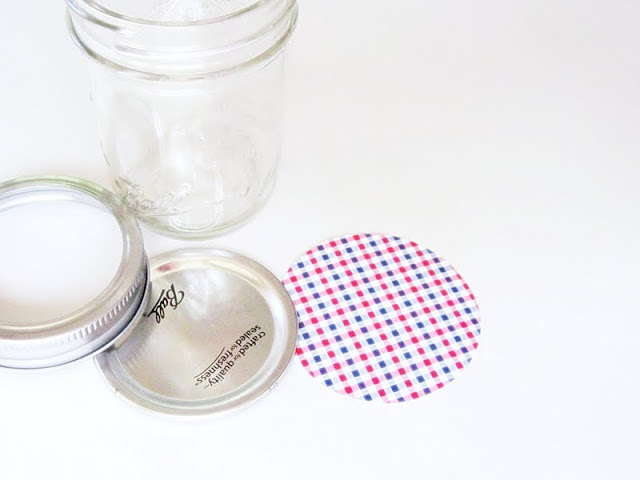 I have seen these cutie mason jars for quite awhile and I absolutely love the idea of drilling a hole in the flat lid and using them as sippy cups. Love, Love, Love It! But my ever frugal self does not see me storing these jars if that is their only purpose. I have 3 gajillion things I could do with them so I decided to make a set of TEMPORARY ones. So instead of drilling a hole, I just used paper inserts and removed the flat lid. Interchangeable and festive too! 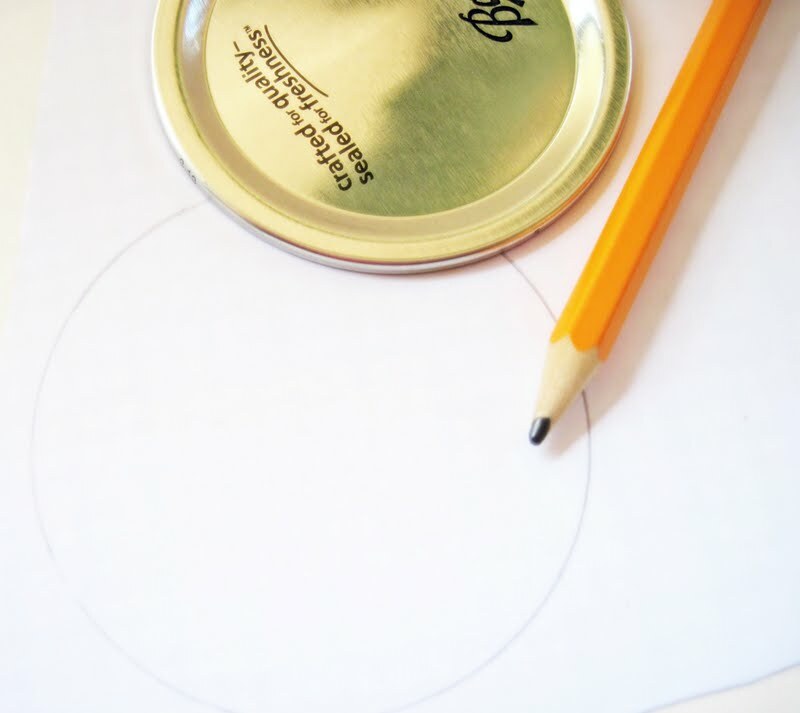 ...and cut your circles out. 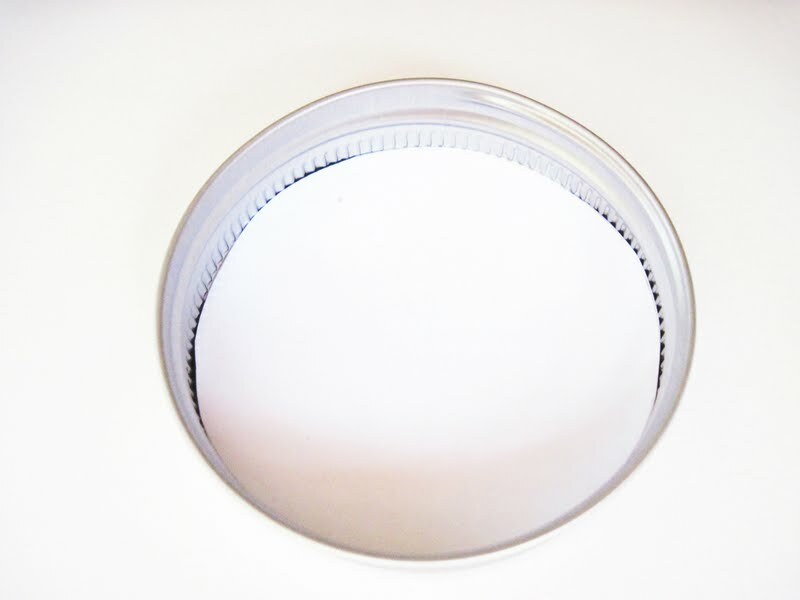 Place the circle inside the screw-on lid with the printed side facing down. Tighten the screw-on lid until the scrapbook paper becomes taut. Do this with all 12. 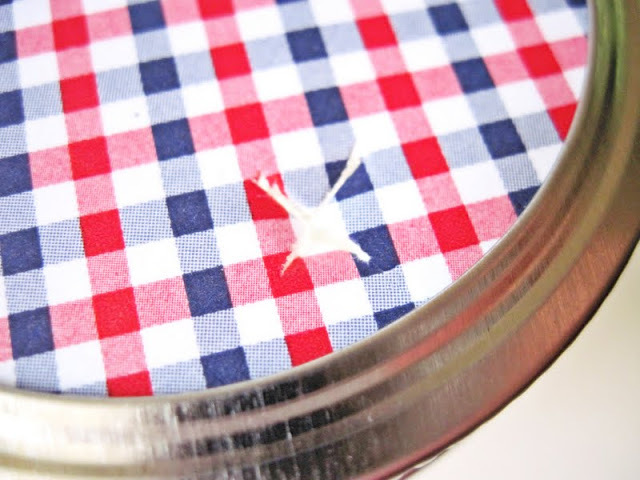 With your craft knife, make a tiny "X" in the center or side of your cup. I chose to do it on the side. Don't make it too big or you could create a hole larger then your straw. 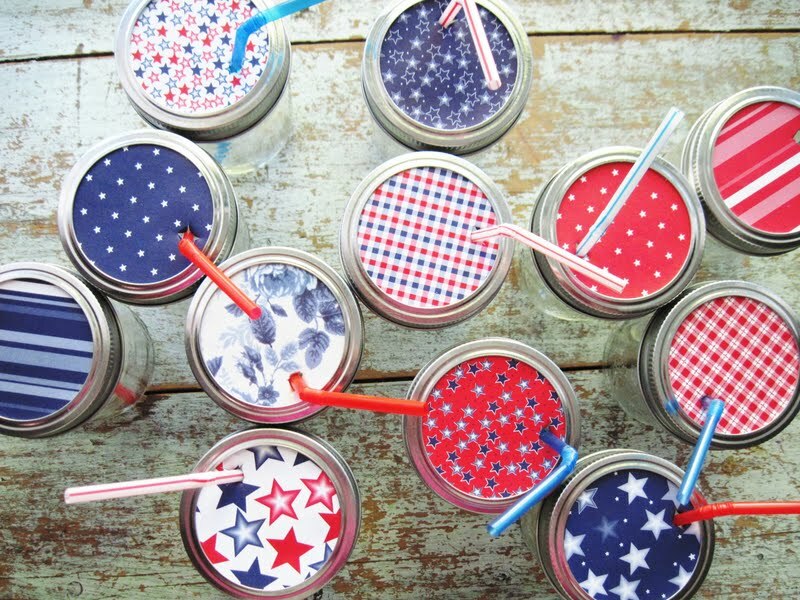 Pop in some festive straws and you have some pretty, patriotic party cups! I will have fun ideas every day this week until Friday! Love this! I'll be featuring it on my blog on Thursday! Sooo cute and very festive!! Love it! So you didn't even have to drill those babies! That is awesome! I am really lucky that Kate has a set with some sweet lids that she ordered...I would ask kel to drill them & get them a month later so I like your idea a lot! PERFECT party sippy! I love this idea! I have a friend who has issues with any type of plastic, and this would be great for her! Was it hard to cut through the lid? Joy x100...I have seen this before and just have not done it yet...now I really really want to. So sweet for a Birthday party. ps they are absolutely fabulous! What a cute idea and I love the paper!!! I am doing a cowboy themed baby shower soon and I am serving the punch out of mason jars! This idea is adorable!!! It inspired me to add a little something to mine! I love your blog!! Jessica, I just love your idea. It is great. How nice, that you can always change the pattern. Gasp! Yes, I did that, for real. Scrapbook paper! Oh, I must do this. For every holiday ever. Love. Please link this to the "life's a Picnic" linky party!! It's perfect! This project is officially bookmarked! Cool summer project for any occassion! These are great! I am definitely going to have to try this. You know, not only are they cute, but they keep the bugs out! That in itself is a plus. I love this idea! So cute and original! I featured this on my friday favorites! You are a genius! 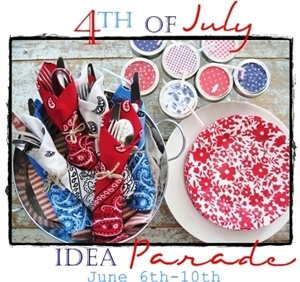 This is the first fourth of July project I have seen that has really made me want to be hosting a picnic or BBQ. So cute! These are so cute and perfect!!! PLEASE We'd love to see you at our Monday Link Up over at www.dimpleprints.com! Love this idea..just became your newest fan! I love this idea too! Jars and the 4th of July! Two of my favorites!! I recently started carrying a 20 oz jar for my own water daily and love love love the idea of a fun top and straw. Great Idea! They do sell the jar lids separately about $3/dozen) so if you wanted to drill a set of lids for this purpose it wouldn't be too expensive and would be easy to store. 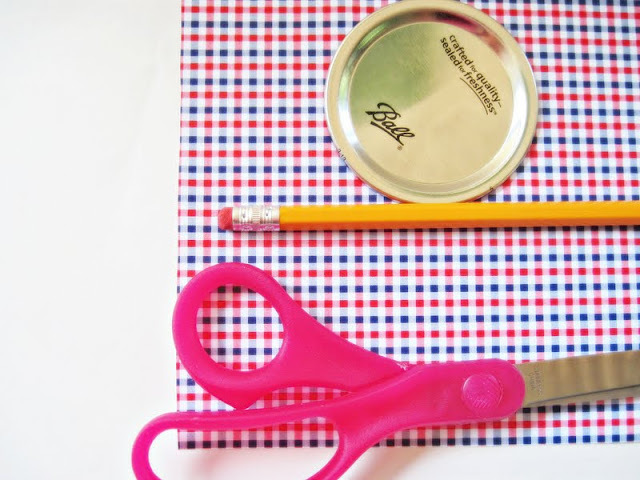 You could put the scrapbooking paper on top that would make it cute, waterproof and reusable too. Thanks for sharing! 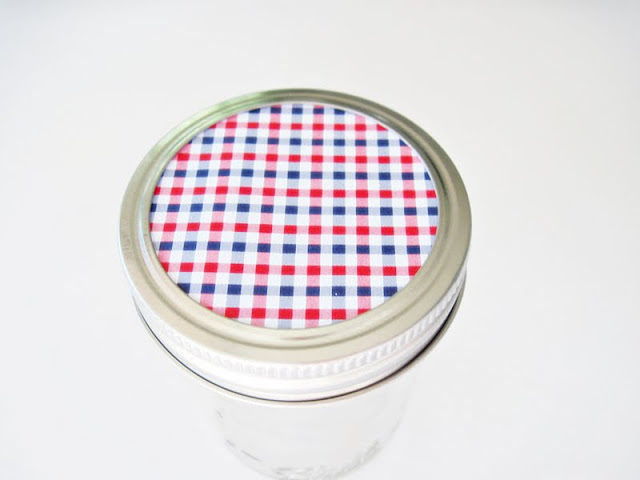 I saw this last week and when I stopped in GW on Saturday I found a set of 12 red/pink/white gingham jar seals for $ .79. I had my hubby drill holes in them (this was the first I'd seen it) and they are prefect. We are all using them and red is a great year round holiday color! Thanks for the idea...I was so luck I didn't have to cut anything and spent less than a dollar to make sippy cups out of the ton of jars we have around here. 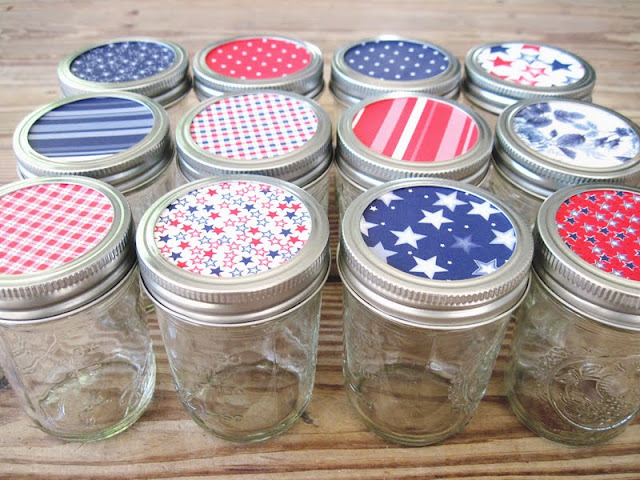 I may use my "used" metal lids, since they say not to re-use them to can with... these are so cute!! They may be permanent cabin cups at the lake! 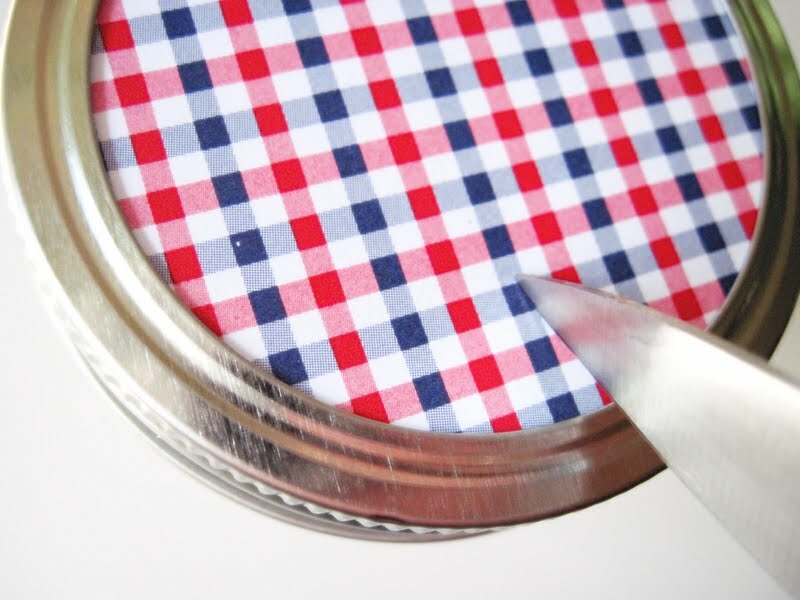 Could we deco fabric on to the mason lids?? The lids would have to be hand washed...but, they would stay nice. I would think that the paper would get yucko really fast when the juice sloshes around. Cheap and easy...just my style! To anonymous above...I actually had suggested using clear contact paper to cover the paper to make them water proof...especially if kids are using them. We tested them as a family and it worked out fine just as paper. And you could definitely decoupage them to the lids. Why not? Thanks for stopping by! As far as Glass and kiddos- they do make plastic canning jars- but that defeats the purpose of the cute mason jars and you might as well get plastic sippy cups....never mind. 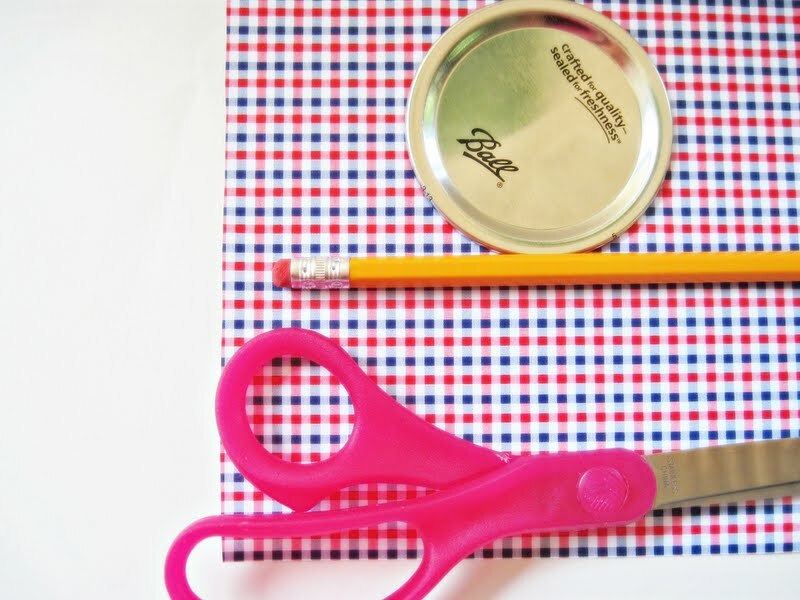 Cutting circles out of vinyl or plastic coated placemats would probably work, too. I totally made these for my 4th of July party...and I made them for a PJ's and Pancakes party I'll be posting on this week, too! Thanks for sharing. This is genius. Would it be ok if I link to my blog at fiestaresistanceatblogspot.com? These look fantastic! Def will share in a July 4th roundup for my readers! Great idea! I will be using this for my hubby's bday/4th of July party! I like the scrapbook paper idea, it's disposable & everyone can write their names right on the paper to easily identify their cup!! 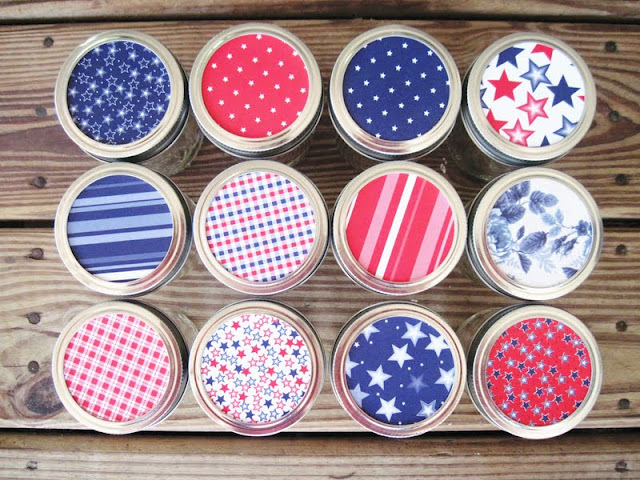 Just featured your 4th of July inspired lids on my blog today and thought you might enjoy checking it out! These are SO cute! I just got my first set of mason jars and I am so excited to try this! Hello, Jessica! 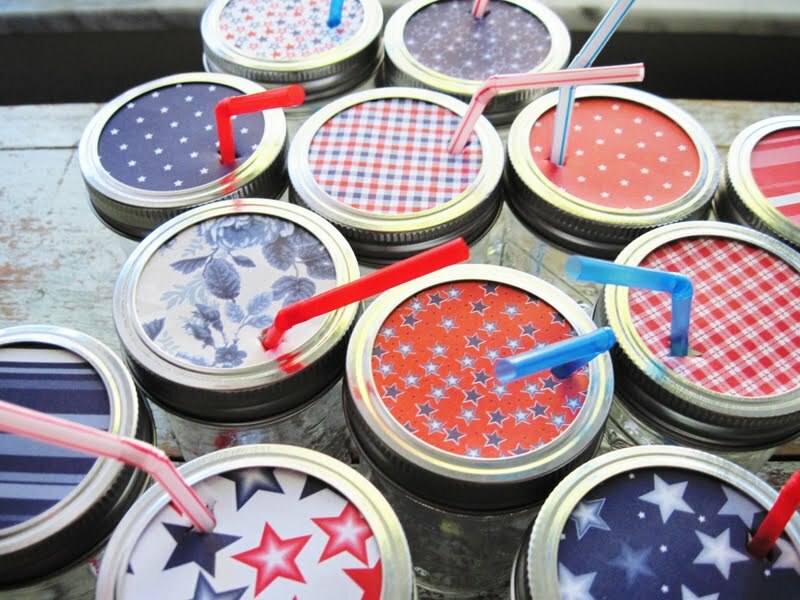 Stopping by to let you know that I featured your super cute and festive Mason Jar "Sippy Cups" in a Memorial Day themed blog post today: http://www.chattingoverchocolate.com/2013/05/memorial-day-pinspiration.html ... Thanks so much for sharing and have a terrific upcoming holiday weekend!! My craft knife stinks so wouldn't poke a hole. I found that if you keep the lid on the jar and hammer a nail into it, it pokes a hole! You'll have to widen the hole with needle nosed pliers or something, but hey. It works amazing! You could also put twine around the jar. That gives it a nice rustic feel. Hi Charity! I ONLY used paper...not the lid too. That way you can change them out pretty easy. As long as it doesn't slosh around and wet the paper, you are good. I actually have a laminator and do it that way too. Just laminate the paper and then trace and cut your circles out. But the nail method DOES work. Awesome! Thanks for stopping by friend!